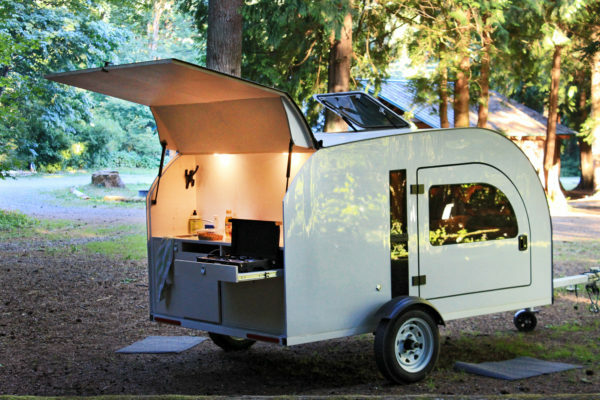 The DROPLET trailer is a unique Scandinavian-inspired teardrop camping trailer. 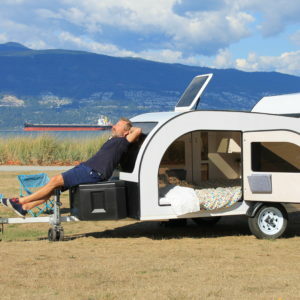 This trailer is ideal for the urban camping-fanatic who is looking for a comfortable and easy way to escape into nature. With a lightweight and durable built, this teardrop was designed to become your road tripping best friend. 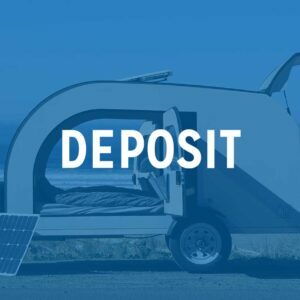 The DROPLET Base Package includes a DROPLET teardrop trailer, 1 ECOFLOW River lithium 400W battery, a 6″ hypoallergenic memory foam queen sized mattress, as well as a sheltered kitchen space, equipped with a dual burner stove, electric fridge, and a hand pump sink. 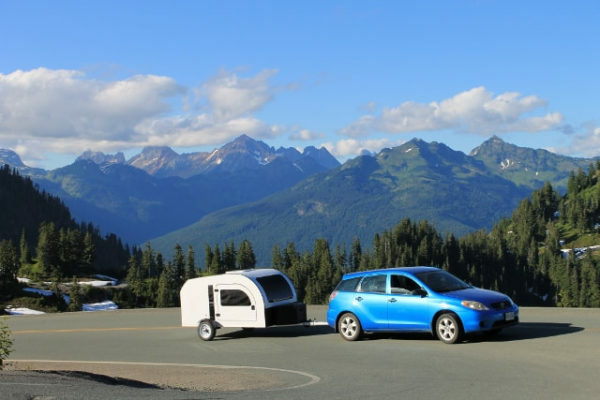 The droplet base package is ideal for the recreational camper desiring a simple rig that is always ready for the next adventure. Price does not include applicable taxes or shipping cost. The shell of DROPLET is built with a high tech pressed laminate of aluminum foam and wood. This method of construction is inspired by boat and aircraft construction and uses very little screws. This results in an extremely light, strong, and highly insulated structure, with great vibration dampening effects. 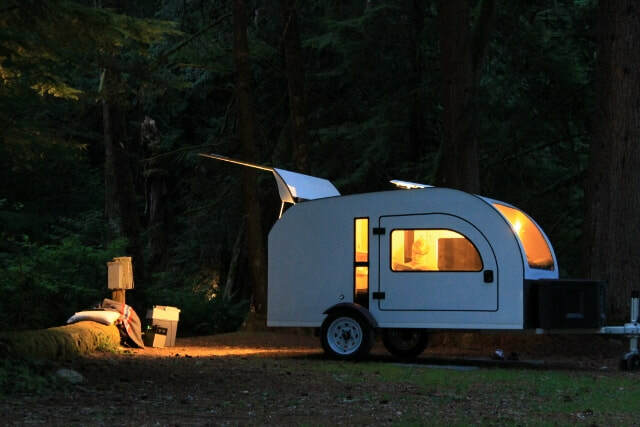 Perfect for a travel trailer. The kitchen area in the DROPLET is made of an acrylic material, for a clean and sleek cooking and prepping surface. The kitchen has space to both hang dishes and store them out of sight in a wide pull-out drawer. The space is lit by 2 flush LED lamps, that are tap operated. 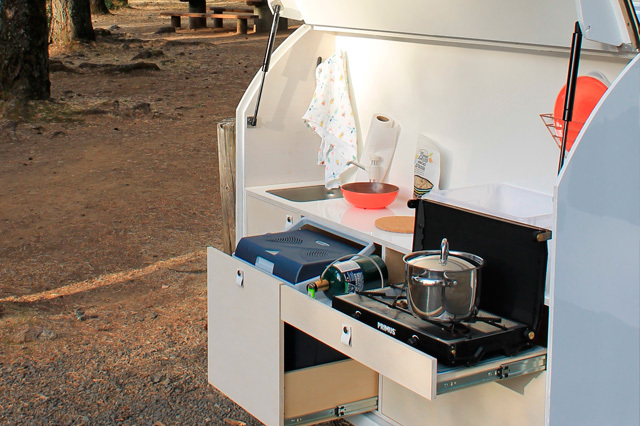 The DROPLET includes a 12V slide-out fridge and a 2 burner propane cooking stove. The recessed sink is large enough for all camping needs and is hand-pump operated with a closed loop water system. 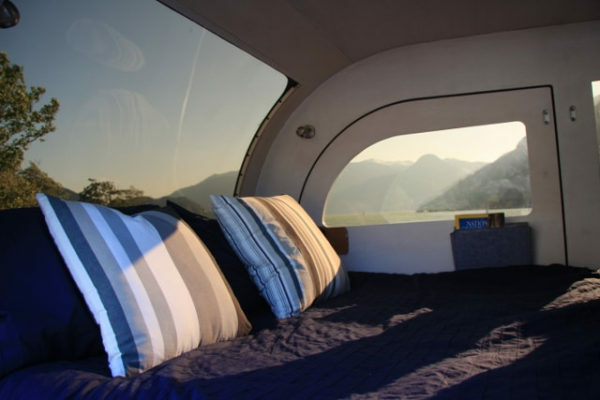 the interior is large enough to accommodate a comfortable 6″ queen size mattress (60″ x 80″ / 1.52m x 2.03m). There are 2 cabinets and 2 shelves at the foot of the bed for storing electronic devices and clothes. 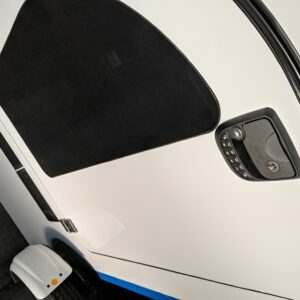 There is additional storage in the form of felt pockets on the doors of the cabin to store night essentials. 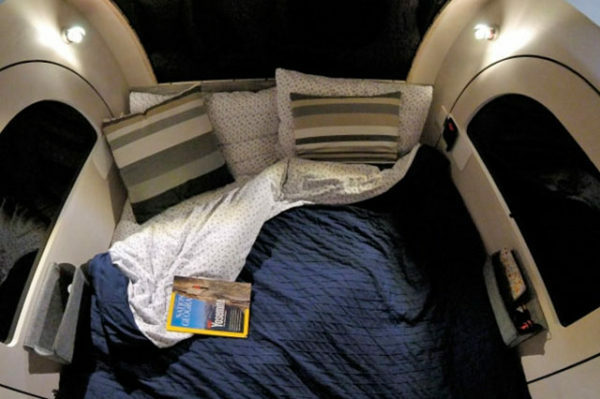 The cabin is lit with 2 LED reading lamps, that are tap operated. The DROPLET is bright and spacious. The half dome front window and complementing side windows are tinted ( bronze -26 % light transmission) for privacy and heat transfer control. In addition, the DROPLET makes use of the biggest possible yachting hatch. 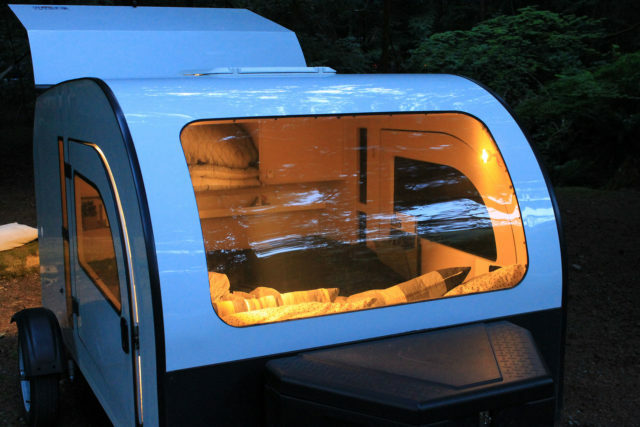 It has a lockable AIRstream position to allow for air movement and slide windows and vents for natural air flow. The DROPLET doors are designed for easy entrance and exit. • 1-7/8" receiver (for 1-7/8" ball). Ideal ball height is 15"
• 150W built-in inverter with 110V and USB outlets. • 12V Lithium portable battery 440Wh. • 12V compressor portable cooler. • wall mounted cutlery holder. • wall mounted Dish holder. • 6" hypoallergenic foam mattress.